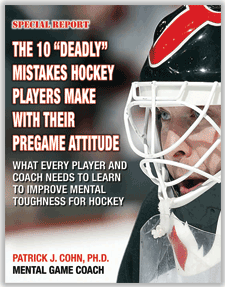 Hockey is not a game where one team dominates the play on the ice for 60 minutes. 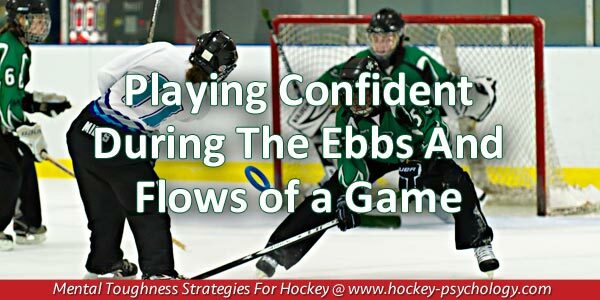 Hockey is a game of back and forth… How you handle the moments where the other team takes over the flow of the game will impact the outcome of the game. It is easy for some players to throw up their hands and tell themselves “We just don’t have it this game” or buy into the notion that the other team is far too superior. This negative mindset uses a small sample (a few shifts or a period) and generalizes, projects or predicts a negative outcome. The problem is that hockey has ebbs and flows and if you get down on yourself before the game is finished, you have effectively taken yourself out of the game and mentally forfeited. Seeing a game as a foregone conclusion or eventual loss takes the fight out of a team… Most likely, you will play at half speed, be hesitant going after loose pucks, play back on your heels, experience an uneasy tension when you take your shift on the ice and be fearful of making mistakes. The result of this mentality is usually making the very mistake that you feared in the first place. In order to tip the scales in your favor, you need to realize that the flow is in constant flux and it only takes one play or one shift to swing the tempo of the game in your favor. Even NHL teams need to deal with the constant changing momentum of games. The San Jose Sharks lost Game 2 of the 2016 Stanley Cup Finals to the Pittsburgh Penguins at 2:35 of OT to give the Penguins a 2-1 win and a 2-0 lead in the best-of-seven series. After the game, Sharks coach Peter DeBoer remained positive and urged his team to focus on being aggressive and playing with confidence. With the Shark’s understanding of how the flow of a game or series can change at any moment, San Jose clawed their way back into the Stanley Cup final with a 3-2 overtime win over Pittsburgh in Game 3. Joonas Donskoi who scored with 7:42 left in overtime to give the Sharks the victory identified confidence as the key to the team’s success. Use the Scoring Method – To score a goal, you need to focus on where you want the puck to go, not where it has been. To change the flow of a game, you need to look for opportunities to make positive plays instead of reminding yourself of the moments when you were not playing your best hockey. 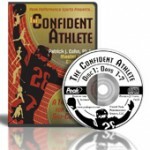 You want to have faith that at any moment the momentum of the game can shift in your favor.